The threat of disruption is a concern to established firms across industries, but why do so few actually take a proactive stance to disrupt themselves? 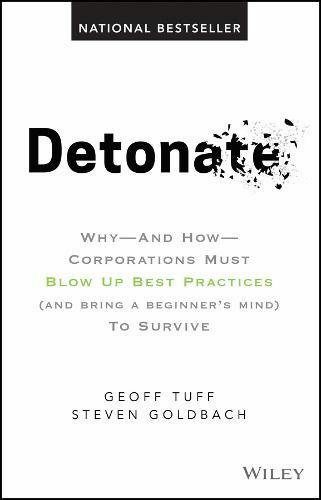 In this episode of Mastering Innovation on Sirius XM Channel 132, Business Radio Powered by The Wharton School, guest Steve Goldbach, Principal and Chief Strategy Officer at Deloitte and co-author of Detonate: Why – And How – Corporations Must Blow Up Best Practices (and Bring a Beginner’s Mind) to Survive, talked about how to break away from organizational inertia. Goldbach explained that companies struggle to implement disruption because of human nature. People want to be successful in their organization, and this leads to making safe calls on marginal bets. This is why many companies still stick to “best practices” that are no longer the right ones for the future. For example, he highlights the pervasive problem of doing financial forecasting in reverse. Companies usually start with growth projections and work backward through calculating profit to get how much they can afford to spend. Goldbach also discussed the role of emerging technologies in the consulting industry and the inspiration behind his book. Nicolaj Siggelkow: How has the field of consulting changed? What are the big developments there? 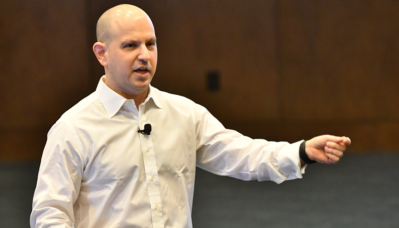 Steve Goldbach: The most important one that I’d highlight is the infusion of technology into what has, for most of its existence, been a very human-to-human business. The industry is going to go through a material transformation over the next while as we will need to start leveraging many different technologies, whether it’s cognitive, or artificial intelligence, or other aspects of data and analytics that allow our people to be more productive. But I do think that all of this technology will still be a support mechanism to helping an executive make a decision. And for that, I do think that you will still need that trusted advisor to work alongside of the technology. If there were any advice to your former students, it would be that they need to be not just really smart about strategy, but technologically savvy so that they understand the tools available in order to make best use of those. Siggelkow: Great. So, coming to the book. Can you first give us a little bit of the background on what experiences led you to write this book? Goldbach: My co-author, Geoff, and I had the following observation, and it was with all of our clients, all of the executives we speak to. Something that’s pervasive within business leadership today is this focus on disruption. It’s a concern for everybody. Everybody is discussing it. And we see relatively few organizations have a really proactive stance towards disruption, like, “We’re going to disrupt ourselves.” Or they might say things like that, but the moves that are made are relatively minor. And we were wondering why that was, and what we saw was the motivation, the motivations at the individual human level. People felt like what would make them successful in their organization was to make the safe call on marginal bets, i.e. use best practices, right? But as we know, if the world is changing really quickly, and the context around when those supposedly best practices were developed is now different, then they’re unlikely to be the right ones for the future. But the company cultures and their own incentive systems haven’t caught up to the future world, and it’s not really safe for individuals to make those choices. What ends up happening is they follow those best practices and they invariably don’t work, because the context is different. And then they put more pressure and more burden of proof in order to prove the next generation of that because something went wrong before. They go back to the things that have worked and that are tried and true, and invariably they don’t work. Companies get into this vicious cycle. And so, what we talk about in the book is the processes that we think are the most pervasive that need to be rethought. How do you break that vicious cycle? What are the things that you can do as an organization in order to break that downwards spiral which tends to lead to not-so-happy outcomes? Siggelkow: Yeah. Of course, there’s always a trade-off. We need some rules and principles in organizations. We cannot reinvent the wheel every day. At the same time, as you absolutely point out, there are lots of rules that used to be good but just don’t work anymore. But, who has the guts to question and change them? Goldbach: We aren’t suggesting in the least that there is no benefit to rules or processes. In fact, there are many. Think about safety within industrial organizations or on an oil rig. There are lots of good reasons for safety, and we would absolutely think about things in that bucket. One classic example is the way that lots of organizations collect customer insights. Classically, organizations leverage tools like surveys or focus groups. With all the learning that’s been developed in the world of cognitive psychology around biases and behavioral economics and understanding how people respond to those kind of stimuli, we know that you can ask someone what they think about what they want, but if it’s something really new, they can’t really tell you unless you put them to a choice in the real world. And so oftentimes those tools really fail. We’re just saying let’s not use poor tools now that we’ve learned that there’s something else. Let’s discard those and use better tools like observation techniques or actually amalgamating behavioral data, which is much more likely to be successful. Siggelkow: Every company is trying to become more customer-centric, right? And you’re saying, “Well, just going to customers and asking them may not be the best way to go about this.” Another of these best practices (and maybe the most favorite one in our organizations) is financial forecasting and budgeting. What are some of the best practices that you would ask people to rethink? Goldbach: I’m not sure I’d ever label this particular one as best, but it’s pervasive. We did some research to try to understand the pervasiveness of the behaviors that we talk about in the book, and this one is almost ubiquitous. The way companies tend to do financial forecasting is they do some extrapolation of the past. They say, “We’ve been growing at 5% a year, and the market is growing at 5% a year. If we continue to get our fair share of the market,” — or more likely when they’re doing a budget — “we’re going to increase our market share, our revenue for the next few years will be X.” And then they say, “We’ve committed to the Street that our profits will be Y. So therefore, this is how much we can afford to spend.” That’s the sort of logic that companies go through when doing financial forecasting. The problem with that is that the world literally works in the opposite way. You spend money to change people’s behavior or to keep them doing the same thing, in order for you to get revenue. The problem is not necessarily just a forecast that you end up with, but it’s the mindset that, somehow, you have an unalienable right to revenue in the future. Like it’s just because we exist, we will continue to get revenue. I believe in being very customer-, consumer-, client-centric, but that means continuing to try to delight them and to try to figure out where we haven’t served them well. To do that, sometimes you need to spend some money that doesn’t necessarily fit the pattern of how you’ve spent it in the past. I would rather that organizations think first about what behavior they want to cause in the marketplace and their customers, how much time and through what activity they could successfully cause that behavior, and then what the revenue result would be. What would the profit result be if they successfully did that and used that as the economic hypothesis? That also has the benefit of, “Look, you’re in control of your cause, but you’re not as in control of the outcome.” If you’re constantly testing how you can gain and also change behavior, then that’s a far better way to be thinking about forecasting. Steven Goldbach is a principal at Deloitte Consulting LLP and serves as the organization’s chief strategy officer. He is also a member of the Deloitte U.S. executive leadership team. Before joining Deloitte, Goldbach was a partner at Monitor Group and head of its New York office. Goldbach helps executives and their teams transform their organizations by making challenging and pragmatic strategy choices in the face of uncertainty. He is an architect, expert practitioner, and teacher of the variety of strategy methodologies developed and used by Monitor Deloitte over the years. Serving clients in many industries, including consumer products, telecommunications, media and health care, Goldbach helps companies combine rigor and creativity to create their own future. Previously, Goldbach was the director of strategy at Forbes. He holds degrees from Queen’s University at Kingston and Columbia Business School. You can find more @Steven_Goldbach.